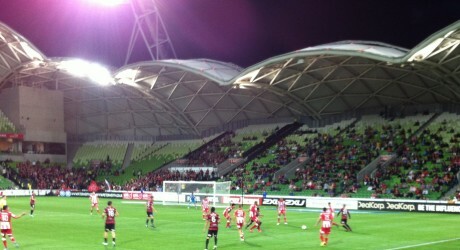 Melbourne Heart could not give skipper Harry Kewell a winning end to his career after going down by three goals to two to Western Sydney Wanderers at AAMI Park before a noisy crowd of 10,003. The retiring star brought his family on through a guard of honour, but that was as far as the pleasantries went, with Nikolai Topor-Stanley crashing into his back a minute after the Wanderers central defender scored the opening goal with a header from a precise Shinji Ono free kick. Heart conceded that goal in the 28th minute, but fought back to equalise then go ahead with only 18 minutes left to play, only to be overcome by two late strikes as the defensive failings which have plagued Heart all year resurfaced. Both sides started very cagily after Mark Bridge became the first of ten players booked by referee Jarred Gillett. But gradually the match settled with both teams prepared to attack. Heart had given a start to young Steven Mauk and he was prominent in the first half with a couple of shots, one of which led to a series of corner kicks and another where he just dragged his effort past the left hand post. Heart equalised in the 35th minute, when Kewell found Orlando Engelaar about thirty metres from goal in heavy traffic. But as he has done before this season the big Dutchman hit a brilliant grounder across Ante Covic and in off the far post. A great goal, thanks in part to Kewell’s assistance. Kewell had a shot which had to be deflected for a corner kick, then Matthew Spiranovic had to head the ball over his own crossbar from virtually underneath it as Heart went for another goal just before half-time. David Williams was withdrawn at the interval, being replaced by Aziz Behich, and a string of bookings broke up the flow of the game in the early part of the second half. The visitors should have gone ahead again when the referee found a penalty kick in a challenge in the Heart area. Shinji Ono, who can normally be relied on to take advantage of dead ball situations, put this one over the bar. So Heart was still in the game and took the lead in 72 minutes. Jason Hoffmann came down the right as he had been doing throughout the game but this time trusted himself to shoot. The ball took a slight deflection but it was enough to wrong foot Covic and dropped over him into the net. Thoughts of a home win to end the season flourished only briefly as the Wanderers were determined to get second spot on the ladder. The referee had a big impact on the result allowing substitute Brendan Santalab to bowl over Robbie Wielaert before scoring Wanderers equaliser in the 81st minute. That kind of incident had been regularly pulled up earlier in the game but in the last phase several were allowed, perhaps because another booking would have meant expulsion for the offender and consequent missing of the first match of the finals. Heart could not withstand the red and black tide and Jusuf Hersi sprinted through a tiring defence to grab the winner with only four minutes of normal time left. Kewell walked a lap of honour to mark the end of his stellar career but his team finished at the bottom of the ladder showing that the new regime will have to make big improvements next season if Heart are to challenge for the finals.